We’re always adding new businesses to our Shop Durham program for you to save at and support! This month, there’s eight new spots for you to use your card at including Guglhupf, Bull City Laughs Tours, Triangle Cellular Repair, Horse & Buggy Press and Friends, and more! Check them all out below. 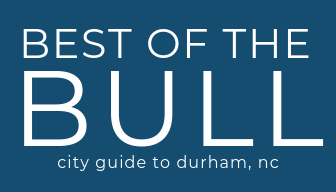 Shop Durham is a Best of the Bull program that helps you discover the best local spots around Durham. Use your Shop Durham card to recieve rewards, discounts, and freebies at hundreds of locally owned Durham businesses all year long! Shop Durham Offer: Free single Brotzeit w/ purchase of 2 Small Plates or 1 Large Plate. Valid Tues – Thurs. Established in 1998, this innovative Bakery, Cafe and Biergarten serves contemporary cuisine with a nod to its southern German roots, emphasizing local and seasonal ingredients. Our expanded dinner menu focuses on the concept of Brotzeit (“Bread time”), a traditional German dining style emphasizing breads, charcuterie, cheeses, smoked and marinated fish, and savory spreads. At dinner, you’ll find even more options to mix and match … a plethora of tasting plates perfect for sharing, our popular classics, and delectable desserts… all perfectly suited for enjoying the outdoor patio biergarten-style, or dining at a cozy table inside. Shop Durham Offer: Free 12oz drip coffee with a $15 purchase. Valid Tues – Fri, Bakery + Cafe hours only. Established in 1998, this innovative Bakery, Cafe and Biergarten serves contemporary cuisine with a nod to its southern German roots, emphasizing local and seasonal ingredients. We are not your traditional Hofbräuhaus and you do not need to dig out your Lederhosen…we celebrate the progressive, modern aspects of our heritage. Triangle Cellular Repair is the premier mobile device repair center in central North Carolina. TCR’s first location opened in Raleigh in 2012 and we remain locally owned and operated as we expand. We strive to provide outstanding customer service by solving your mobile device needs. Not only are we focused on offering you the fastest, highest quality device repairs including micro soldering, but we can also help you through our ability to buy your old phones and offer a selection of devices for sale as well. We are authorized to sell a great selection of name-brand, quality accessories that can protect your cell phones and tablets. Stop by any of our locations in the Triangle to experience TCR’s repair proficiency and: Get Back To It!! Horse & Buggy Press is an award winning graphic design, letterpress printing, and collaborative book publishing studio that was established in 1996. Horse & Buggy Press and Friends is the 500 plus square foot gallery curated by Dave Wofford which features work by established artists and craftspersons from across the Southeast, with about half from the Triangle. The gallery features a main wall with solo and thematic exhibits, and other portions of the gallery feature a wide range of work with new work rotating in constantly, including an area displaying H&B books, and a bookstall Dave curates featuring artist monographs, museum catalogues, and works by small presses that are hard to find in most book stores. There are often popup events, where H&B collaborates with writers, historians, artists, and more and receptions are held every month or two, usually on Saturdays from 5-7pm in conjunction with Craven Allen gallery located just down the block. Follow the haps by getting on our email list and expect to receive digital newsletters every couple months. Shop Durham Offer: Purchase 2 or more tickets and get a Free ticket! It’s a one of a kind comedy tour of Durham that features the city’s history, and yep, it’s on a renovated, open-air school bus. You’ll meet at the Beer Durham parking and hop on the bus to visit places like Black Wall Street, NCCU, Duke University, American Tobacco Campus, Durham Bulls Stadium, Duke Gardens, and historic neighborhoods. Your tour guide and comedian, Brandon, also highlights local spots to grab food and where to drink like a local. Whether you’re visiting, new to town, or been here for 40 years, you’re guaranteed to learn something new about Durham. Shop Durham Offer: 10% off your first 5 pet care visits! Caring for your pets from nose to toes (and wagging tail)! Nose, Toes & Tails Pet Care offers a full range of pet care services including: Pet Sitting, Dog Walking, Business Travel-Vacation Care, Waggin’Trail excursions, Pup-Play Dates, Farm Critter Care, and Pet Taxi. We happily serve the vibrant communities in and around Durham! Follow us on Facebook @WagginTailTrails, Instagram @NoseToesTails…and when you’re in the neighborhood visit us on Nextdoor and Yelp. Newly opened hair studio off North Roxboto St. Servicing men, woman, & children. Shop Durham Offer: Free engagement session with full day wedding package or $100 off other wedding packages! Haven’t got your Shop Durham card yet? You’re missing out! Gets freebies, discounts, and deals at hundreds of locally owned Durham businesses– all year long! Grab yours for $15 here!